Veronika Eberle was born in Donauworth, Southern Germany in 1988. She began taking violin lessons at six at the Richard Strauss Konservatorium in Munich. Since 2001, Veronika has been studying under Ana Chumachenco at the University of Music and Performing Arts Munich. She won the grand prize of the Yfrah Neaman International Competition in Mainz in 2003. At the age of sixteen, she performed Beethoven's violin concerto with Sir Simon Rattle and the Berlin Philharmonic, which brought her to international attention. Her appearances with the world's leading orchestras are such as the London Symphony Orchestra, the Royal Concertgebouw Orchestra, the Tonhalle Orchestra Zürich, the Leipzig Gewandhaus Ochestra, the New York Philharmonic and the Los Angeles Philharmonic Orchestra. She regularly performs with Sir Simon Rattle, Daniel Harding, Yannick Nezet-Seguin, Robin Ticciati and Allan Gilbert. She received awards including the Audience Awards at the Schleswig-Holstein and the Mecklenburg-Vorpommern Festivals. Also as a dedicated chamber musician, she performs with distinguished musicians such as Shai Wosner, Lars Vogt, Renaud Capuçon and Antoine Tamestitk, and appears at the Lucerne Festival and the Salzburg Summer Festival as well as the Mozart Week 2015 in a trio project with Mitsuko Uchida. She received support from the Borletti Buitoni Trust between 2008 and 2011 and was selected as the artist of the BBC young generation scheme and the "Junge Wilde" in Dortmund. Suyoen Kim was born in Münster, Germany in 1987. She received her first violin lesson at the age of five and went on to study at the University of Music Detmold, Münster Campus under Helge Slaatto. After having obtained her master's degree in 2010 at the University of Music and Performing Arts Munich under Ana Chumachenco, she participated in the Further Masters Studies at Kronberg Academy until summer 2012. As her talent has already drawn international attention in her early years, she was referred to as a "brand new world star" by Danish "The Jutland Post" in 2003. In the same year, she won the first prize as well as the audience award and the prize for the best interpretation of Contemporary Music at the Leopold Mozart International Violin Competition. 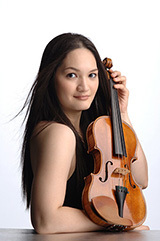 She was also the first prize winner of the Joseph Joachim International Violin Competition, Hannover in 2006. She has performed with internationally acclaimed conductors such as Kurt Masur, Eliahu Inbal, Myung-Whun Chung and Andris Nelsons. Also as a passionate chamber musician, she performed with renowned musicians such as Marta Argerich, Yuri Bashmet and Myung-Whun Chung recently. Her first album of Hartmann's "Concerto funebre" with the Bavarian Chamber Philharmonic Orchestra and Pietari Inkinen was recommended by BBC Radio 3 as the best available recording of this concerto. Her latest recording of Beethoven's violin concerto and two Romances was released by Deutsche Grammophon in March 2016. 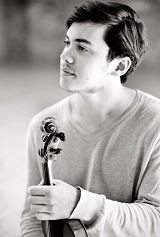 Born in 1989, Benjamin Beilman studied at the Music Institute of Chicago as well as the Curtis Institute of Music with Ida Kavafian and Pamela Frank. He went on to further study at the Kronberg Academy with Christian Tetzlaff. His international career was launched after winning two first prizes at the Montreal International Musical Competition and the Young Concert Artists International Auditions in New York both in 2010. In 2014, he was chosen as a fellowship of London’s prestigious Borletti-Buitoni Trust which supports outstanding young musicians. He was also recognized as the young promising musician by the Washington Post, the New York Times, and the Strad magazine. He has performed with notable conductors and orchestras including Sir Neville Marriner, Yannick Nézet-Séguin, the Philadelphia Orchestra, the Frankfurt Radio Symphony Orchestra and the London Philharmonic Orchestra. He also performed at the Louvre and Wigmore Hall, as well as the Marlboro Music Festival, Music@Menlo (California) and Verbier Festival. His debut album “Spectrum” was released from Warner Classics in March 2016. Born in Ruse, Bulgaria in 1976, Svetlin Roussev began his musical education at five at the music school in Ruse. Later he studied under Gérard Poulet, Devy Erlih and Jean-Jacques Kantorow at the Conservatoire de Paris. He has won numerous prizes at many international competitions including the Indianapolis, the Long-Thibaud, and the Melbourne Chamber. In 2001, he won the first prize as well as the special audience prize and the special prize for the best interpretation of a Bach concerto at the first Sendai International Music Competition in Japan. As a soloist, he has performed with the world's renowned conductors such as Leon Fleisher, Yehudi Menuhin, Myung-Whun Chung and François-Xavier Roth. Greatly trusted by the conductor Myung-Whun Chung, in 2005, he was appointed as the concertmaster of the Radio France Philharmonic Orchestra. He was also a concertmaster of the Seoul Philharmonic Orchestra from 2007 to 2015. Aside from his concert activities, he became a professor at the Conservatoire de Paris as the successor to Kantorow in 2008. Since April 2015, he has been serving as the artistic director and the artist in residence of the Sofia Philharmonic Orchestra in Bulgaria. 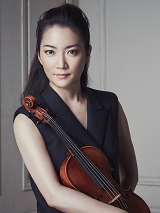 Born in Tokyo, Akiko Suwanai studied the violin with Toshiya Eto and graduated from Toho Gakuen Music High School and Toho Gakuen School of Music. In 1990, she became the youngest ever winner of the International Tchaikovsky Competition. From 1991, she studied under Dorothy DeLay and Cho-Liang Lin at The Juilliard while also attending Columbia University. She moved to Europe and studied at the Hochschul der Künste in Berlin with Uwe-Martin Haiberg. She has been establishing a prestigious international career performing regularly with renowned orchestras such as the New York Philharmonic, the Philadelphia Orchestra, the Berlin Philharmonic and the London Symphony Orchestra. She is active bringing out the contemporary works among which she performed the world premiere of Peter Eötvös' violin concerto Seven at the Lucerne Festival with the Festival Academy Orchestra conducted by Pierre Boulez. Conducted by the composers themselves, she also performed the violin concertos by James MacMilan, Krzyztof Penderecki and Esa-Pekka Salonen. She served as a jury member of the Queen Elisabeth International Violin Competition in Belgium in 2012 and 2015. She is Artistic Director of the International Music Festival NIPPON, which she launched in 2012. Her latest CD including Franck Violin Sonata, R. Strauss Violin Sonata and Takemitsu "Hika", was released in April 2016.
orn in Taiwan in 1989 and raised in Australia, Ray Chen is the winner of the 2008 Yehudi Menuhin Competition in London and the 2009 Queen Elisabeth International Violin Competition in Belgium. At the age of fifteen, he was accepted to the Curtis Institute of Music, where he studied with Aaron Rosand. He has performed with prestigious orchestras such as the Leipzig Gewandhaus Orchestra under Riccardo Chailly, the Orchestre National de France, the London Philharmonic Orchestra, the Czech Philharmonic, and the National Symphony Orchestra (USA). On Bastille Day in 2015, he joined Daniel Gatti and the Orchestre National de France for a televised concert on the Champs-de-Mars in Paris in front of an audience of over 800,000. His premiere album "Virtuoso" released on Sony Classical in 2011 received glowing reviews from major publications and won the Germany's prestigious ECHO Klassik Award of the same year. His third recording, an all-Mozart's album with Christoph Eschenbach and the Schleswig-Holstein Music Festival Orchestra, was released in 2014. Born in Munich to a German father and a Japanese mother, Arabella Miho Steinbacher began taking violin lessons at three. At nine, she became the youngest violin student of Ana Chumachenco at the University of Music and Performing Arts Munich. Further musical inspiration and guidance were provided by the violinist Ivry Gitlis. Her career was launched in 2004 with an extraordinary debut with the Radio France Philharmonic Orchestra under Sir Neville Marriner in Paris. Since then, she has performed with distinguished conductors such as Lorin Maazel, Christoph von Dohnányi, Riccardo Chailly and Herbert Blomstedt and with world leading orchestras such as the London Symphony Orchestra, the Bavarian Radio Symphony Orchestra, the Chicago Symphony Orchestra and the Cleveland Orchestra. Since 2009, she has recorded exclusively for Pentatone. In the same year, her CD of Dvořák and Szymanowski's violin concertos with the Berlin Radio Symphony Orchestra led by Marek Janowski was published and won her second ECHO Klassik Award. Her CD of Mozart concertos with the Festival Strings Lucerne was nominated for the Gramophone Award as the recording of the year 2014. She is also active as an ambassador for CARE, a leading humanitarian organization fighting global poverty and providing lifesaving assistance in emergencies. 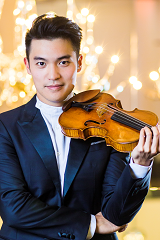 As the winner of the 2015 Queen Elisabeth International Violin Competition in Belgium, Ji Young Lim has a four-year loan f the Stradivarius 1708 Violin "Huggins" from Nippon Music Foundation as a part of the prize. 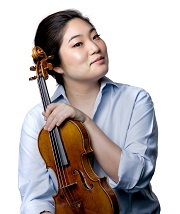 Born in Seoul in 1995, Ji Young started the violin at the age of seven. 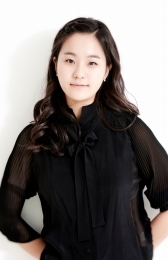 She studied at the Korea National Institute for the Gifted in Arts and is further pursuing her study at the Korea National University of Arts under Nam Yun Kim. She won the first prize at the 2013 Euroasia International Competition in Japan and also received a number of prizes at international competitions including the Indianapolis, the Montreal International and the Henri Marteau. Already active internationally, she has toured in Japan, the U.S., Canada, Germany, Switzerland and other European countries. She has also been invited to international music festivals where she performed with famous violinist-conductors such as Maxim Vengerov, Joel Smirnoff, and Koichiro Harada. She released her debut album of Mozart and Beethoven sonatas from Warner Classics in July 2017. 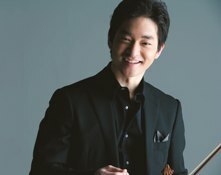 Ryu Goto started his career at the age of seven when he made his debut at the Pacific Music Festival in Sapporo, Japan, playing Paganini's Violin Concerto No.1. Since then, he has appeared as a soloist with the world's leading orchestras including the National Symphony Orchestra, the London Philharmonic Orchestra, the Munich Philharmonic, the Vienna Symphony Orchestra, the Philharmonia Orchestra, the Orchestre Symphonique de Montreal, the Sydney Symphony Orchestra, the Orchestre National de Lyon and the San Francisco Symphony. He has worked with conductors including Lorin Maazel, Vladimir Ashkenazy, Kent Nagano, Fabio Luisi and Leonard Slatkin. In the 2015/16 season, he made his debuts with the hr-Sinfonieorchester (Frankfurt Radio Symphony Orchestra) under the baton of Andres Orozco-Estrada as well as the Philadelphia Orchestra with Yannick Nezet-Seguin. In 2010, he launched "Ryu Goto Excellence In Music Initiative Scholarship" with the NYC Department of Education and provides scholarships to students every year. He does extensive musical outreach and cultural exchanges in Latin America, Southeast Asia and Africa. He records for Deutsche Grammophon in collaboration with Universal Classics Japan and 8 CDs have released so far. In May 2011, he graduated from Harvard University with a BA in Physics. Yuki Manuela Janke was born to a German father and a Japanese mother in Munich in 1986 and received her first violin lessons at three. After the early success at the age of five in the Jugend Musiziert, a German competition for young musicians, she made a successful debut as a soloist performing with an orchestra in Germany at the age of nine. In 2001, she won the highest score at the Bundes-competition, followed by many first prizes at international competitions such as the Louis-Spohr Competition in Weimar and the Johannes-Brahms in Pörtschach. In 2004, she won the second prize (with no first prize winner) at the International Paganini Competition as well as all three special prizes. In 2007, she was awarded the third prize at the 13th International Tchaikovsky Competition and the first prize at the Sarasate International Violin Competition. 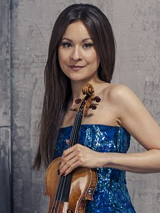 As a soloist, she has performed with notable orchestras such as the Radio Symphony Orchestra Berlin, the WDR Symphony Orchestra Cologne and the National Philharmonic Orchestra (UK). She had served as the first female concertmaster in the 460-year-history of the Staatskapelle Dresden for two years since 2012. In August 2015, she was appointed as the concertmaster of the Staatskapelle Berlin. Born in Madrid in 1991, Pablo Ferrández began studying music with his parents at three. He then continued his studies under María de Macedo and Asier Polo. At thirteen, he was granted admission to the Queen Sofía College of Music in Madrid where he studied under Natalia Shakhovskaya. He currently studies under Frans Helmerson at Kronberg Academy in Germany. 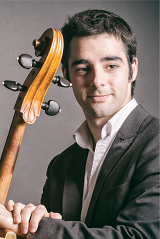 He is the first prize winner of the 2008 Liezen International Cello Competition. In 2013, he received the second prize at the International Paulo Cello Competition and the Edmond de Rothschild prize at Sommets Musicaux de Gstaad. Also, he was the prize winner at the Tchaikovsky Competition in 2015. He has performed with notable orchestras including the Mariinsky Theatre Orchestra under Valery Gergiev, the Orquesta Nacional de España, the St. Petersburg Philharmonic Orchestra and the Helsinki Philharmonic Orchestra. Both as a soloist and a chamber musician, he is regularly invited to international music festivals such as the Rheingau, the Verbier, the Casals, the Spivakov, the Santander and the Kronberg. He also frequently performs with Anne-Sophie Mutter and Mutter's Virtuosi, and in March 2017, he performed Brahms' Double Concerto with her and the London Philharmonic Orchestra. 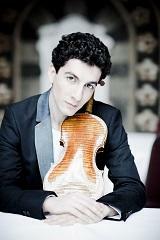 Guarneri del Gesu 1740 Violin "Ysaye"
Sergey Khachatryan was born into a musical family in Armenia in 1985. He studied with Josef Rissin at the Karlsruhe Music Academy in Germany. He won the first prize at the 2000 International Sibelius Competition at fifteen as the youngest ever winner in the history of the competition. He is also the Grand Prize winner of the 2005 Queen Elisabeth International Music Competition in Belgium. He has performed with the world's leading orchestras such as the Royal Concertgebouw Orchestra, the Berlin Philharmonic, the Mariinsky Theatre Orchestra, the Philadelphia Orchestra, the Munich Philharmonic, the New York Philharmonic, the Los Angeles Philharmonic and all major orchestras in London. With his pianist sister Lusine Khachatryan, he has performed recitals at renowned halls including Wigmore Hall, Theatre des Champs Elysees, Palais des Beaux Arts and Carnegie Hall. In 2014, he received the Credit Suisse Young Artist Award and awarded a performance of Beethoven's Violin Concerto with the Vienna Philharmonic conducted by Gustavo Dudamel at the Lucerne Festival. His CD albums including the most recent album "My Armenia" released in December 2015 have been highly praised by the world's major music magazines and press.